Three decades ago, Suzuki literally invented the four-wheel ATV. The original Suzuki LT-125 established Suzuki as the first on four-wheels. With the 30th anniversary of that breakthrough, the Suzuki KingQuad® 750AXi Power Steering carries on the tradition of performance that rules. It's engineered to tackle the toughest jobs and nastiest trails without breaking a sweat. It's loaded with technologically advanced features for impressive all-around performance, including advanced power steering and more responsive handling. The fuel-injected 722 cc engine, housed inside the high-tensile steel frame, develops abundant torque (especially in the low- to mid-rpm range), which gives the 750AXi Power Steering exceptional performance. 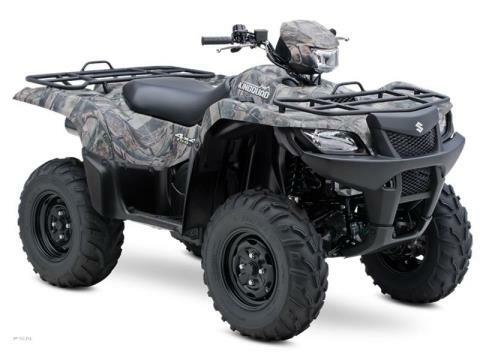 Independent rear suspension, a locking front differential and a host of other innovative features place the KingQuad 750AXi Power Steering at the front of the pack. Independent double A-arm front suspension (6.7 inches of wheel travel) includes large diameter shock absorbers with five-way spring preload adjustment. Pressed aluminum black wheels for reduced unsprung weight. Fully independent, A-arm and I-beam rear suspension with long suspension travel (7.7 inches of wheel travel), includes large diameter shock absorbers with five-way spring preload adjustment and large diameter rear swaybar. Large, 200 mm diameter front disc brakes with single-piston calipers designed for strong, reliable braking performance. 722 cc liquid-cooled DOHC four-valve fuel-injected engine tuned to deliver a mighty low- to mid-range torque along with a powerful high rpm output. Compact four-valve cylinder head with large 36 mm intake valves and straight intake ports for increased cylinder charging efficiency – includes lightweight magnesium valve cover. Semi-gear driven valve system minimizes cam sprocket size allowing a short / narrow cylinder head design and reduced overall engine height. QuadMatic™ CVT-type automatic transmission designed for maximum versatility and convenience – fender-mounted gate-type shifter operation for high / low forward ranges, plus neutral and reverse. Compact torque-sensing limited-slip front differential offers more powerful traction plus light steering effort. A differential-lock system provides serious 4WD traction. Easy-to-read LCD instrument display includes speedometer (mile / km selectable), odometer, twin-trip meters, hour meter, clock, fuel gauge, drive range. A handy storage compartment is mounted on the right-side front fender. Distinctively styled 30W multi-reflector halogen headlights, and compact 5 / 21W tail light and brake light – additional 40W multi-reflector, handlebar-mounted auxiliary light. Large 4.6 gallon fuel tank positioned below seat for a low center of gravity includes vacuum-operated petcock, ratchet-style fuel cap and convenient bar-type fuel gauge.